As a father of 2 girls, it strikes me that it is both the best of times and just the beginning for women in our world. I both revel in the opportunities they have that their ancestors did not while fearing for them at the same time. Since I don't have boys, I don't know if I'd feel differently with sons. Last weekend, we spent last a few days in Concord, MA, mostly touring old battlefields, bridges and homes. What surprised me however, was learning more about the real story behind "Little Women" and Louisa May Alcott. Most interestingly for me was learning about her pops, Bronson Alcott. According to the stories, Bronson was quite a character. My favorite story was that he'd hang out near Orchard House (photos below) in the road with a bag of apples. As people would pass by, he's bend their ear to talk politics, education or whatever else was on his mind. Bronson was a dreamer and a philosopher, and he clearly impacted his daughters in significant ways (learn more here...wow), as all dads do. On the various tours, we learned that the Alcott's were vegans (who knew - but I may be mis-remembering that), and even upgraded their houses with primitive versions of modern plumbing. When Bronson moved into Hillside, the dude literally cut the barn into 2 pieces and reattached them the main house. Bronson was buddies with Emerson and Hawthorne who all lived locally. When we visited Wayside/Hillside Inn (2nd photo below), we learned that Hawthorne (he lived there and actually changed the name of the house) would literally climb the hill behind his house to avoid getting stuck in a long conversation with Bronson. Too funny. Meanwhile, Bronson's daughters most certainly must have seen him as quite a piece of work. From what I've read, he was not an easy guy to live with or deal with - his views on morality and truth were not typical for the time period. Nor were his views on education - all of which he clearly imparted on his daughters. My own view of Bronson is much more idealistic... I felt a spiritual connection to the man while we toured his house and learned of his challenges, ideas and his family. For me, it was a reminder that the influence I have on my daughters cannot be simplified, dumbed-down or taken lightly. It was a good reminder of how the past influences the present and gives us opportunities to shape the future. This dude was a trip... and a great tour guide. He is a Hawthorne geek... in a good way! The quantity and quality of online video and video sites continues to skyrocket. This video is hysterical, and perhaps makes some good points to boot. Yes, of course I'm on Google+, you can find me here and chat me up, hangout with me or put me in various circles. Beware, collegehumor.com is extremely addicting - be sure to also check out the Photoshop Rap as well the amazing Game of Thrones videos. Enjoy. Met some GREAT people last week at a conference and found myself in a very funny, non-linear conversation over beers. Topics included social media, marketing, work, culture, getting mugged and perhaps most importantly, what would happen if the power went out, and stayed out. For good. Here's where "white collar doom" comes from: we lost power for more than a few days after Hurricane Irene in late 2011. During that time it did occur to me on more than one occasion that if the power had not come back on - I'd be pretty well doomed. In fact, if you are reading this blog, it's quite possible that you are just like me... essentially incapable of survival without power, credit cards and the internets. Here's how I think about it; I'm an information worker who spends his days in front of a computer, tapping little plastic buttons. I've not done physical labor of any sort since high school (worked in a variety of places including a furniture store). I've never done construction of any sort. I'm not much of a camper. In fact, just today I set up a new fire pit and had very little luck in actually starting a real fire. 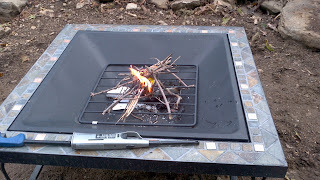 I even resorted to using a fire starter log and even with that... not much to show for it. I have never needed to kill my food in order to survive. In fact, never killed anything myself that I have eaten I don't think. Maybe 30 days on Survivor is in order. That's why today, in the comfort of my backyard I dug up a broken drainage pipe, headed to the hardware store and purchase some "PVC" pipe and something the guy called a "coupler." When I got home, with my very own hands I fixed a pipe situation. Epic! If I can ever figure out how to start a fire, maybe there will be hope.